Part of me feels like a fraud, like a little girl playing make-believe. A 50-something little girl. Im with the band,” I tell the woman at the front desk. “I’m a musician,” I whisper, unsure of myself. She doesn’t question me, just smiles and buzzes me in. I guess the guitar case in my hand is all the proof she needs, but I haven’t convinced myself. At what point does one earn the right to call herself a musician, I wonder, as I make my way down the long corridor. I play guitar daily, I play with other people, and I am here to perform in front of an audience. Is that enough to earn the title? Part of me feels like a fraud, like a little girl playing make-believe. A 50-something little girl. Considering the scale of my entire life, I am new at playing music. I discovered the guitar nearly three years ago, right before my 50th birthday. It didn’t feel like a midlife crisis. I merely picked up an acoustic guitar belonging to my 10-year-old son that was collecting dust in the corner. I intended to tune it for him, maybe show him the three chords I thought I could remember from one semester of guitar class 30 years prior. Learning to play an instrument is literally and figuratively painful. The sore fingertips didn’t bother me as much as the awareness that I “played” the same thing over and over again—badly. I apologized to my roommate, a music lover who generously said, “I don’t mind at all. I love to hear musicians practicing their craft.” She was the first person to call me a musician, but she gave me an even greater gift. I truly believe there are few ideas more empowering than convincing a person it is OK to be a beginner. At anything. At that time, a seemingly unrelated event occurred that further propelled me on a musical journey. I went to hear some bluegrass music. I’ve always been a fan of bluegrass, and I actively search it out. When I saw online that there was a bluegrass meetup at a park in Fountain Valley, I decided to check it out. The group invited me to join in and sing along, since I didn’t have my guitar with me. Some of the songs were familiar, all of them catchy. I hadn’t sung with a group since glee club in school and was surprised how enjoyable it was. It was a blast. The bluegrass “jammers” were so warm and friendly that I had no problem accepting their invitation to come back the next week with my guitar. And so it began: 2 1/2 hours each Saturday with a group of people who collectively said, “It’s OK to be a beginner.” Some were beginners themselves; some had decades of experience. I learned from them all. Week after week, I became more familiar with the songs and more proficient at changing chords. I even learned scales so I could take the lead on a few songs, which never came out like I practiced at home. But no one criticized; they encouraged me, and I did the same for them. Gradually, I became bolder in this setting, singing solo for the first time in my life but finding I actually prefer to sing harmonies in the bluegrass style. Many people in the bluegrass community are brought up around this type of music, but I didn’t grow up in a musical family. My earliest memories of bluegrass came from our memorable trips to the farm—Knott’s Berry Farm. My older brother would take us younger siblings to Knott’s every time he got leave from the Army. I associate the sound of bluegrass and the scent of boysenberries with my best childhood memories. Perhaps my Scottish/Irish genes could explain why this genre pulls me in, since bluegrass evolved from tunes brought over by immigrants of these countries. My own family didn’t settle in Appalachia, but in the Ozarks, before moving to Southern California. Yes, there could be an ancient visceral memory, but for whatever reason, the sounds of a banjo and fiddle make me giddy. I don’t have aspirations to play open mics or gain fame. Why am I doing this? I want to be good enough to play old-timey music for old people—people in convalescent homes who can’t get out to hear music. I want to bring a smile to someone’s face and remind him of happier times. Sprinkle in a little altruism, and I suddenly feel justified and validated in my obsession. Now I walk down the hallway of the New Orange Hills rehab facility, meeting up with my “bandmates,” friends I’ve made through months of jamming in the park. Our audience is only about twice the size of our nine-person ensemble. I tune my guitar and look around, not intimidated by this crowd, instead feeling warm and grateful for the opportunity to share the music I love. We play songs that are older than anyone in the room, some too old to be credited to any songwriter. 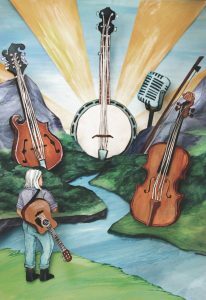 “Bluegrass standards” is how they are described—songs about bank robbers, broken hearts, murder, and death, with a few gospel tunes mixed in. There is a slight concern that the death songs might be inappropriate, but played at warp speed, they actually sound peppy. I make a few mistakes and hope they go unnoticed, but in spite of all my self-doubt, I know I have been given a fantastic gift. I get to share music: with my bandmates, with other people in the park, at bluegrass jams and festivals all over Orange County and Southern California. And now for this audience, a group of people recovering from surgery or trauma. The audience is receptive. It’s mostly patients and their families, with a few employees meandering by and popping in for a tune or two. A gal in the front row seems to be our most enthusiastic fan. She has only one leg and no foot, but she uses her stump to vigorously tap along with our rendition of “New River Train.” She’s disappointed to learn it’s our last song. I laugh to myself. I’ve made it. I don’t think most people would consider me a fraud. A beginner, maybe. Perhaps even an emerging intermediate, but I truly am a musician.